The idea was expressed in “The GQL Manifesto”, which you can find at gql.today. It went out on May 13, a couple of days before a joint meeting in Toronto of the ISO and U.S. standards groups that are responsible for the SQL standard. The front page includes a poll: over 2,600 have voted on the proposition “Should the property graph community unite to create a standard Graph Query Language, GQL, alongside SQL?” and from day one (when the first thousand votes came in) the result has sat at around 95.4% Yes to 4.6% No. There are planned extensions to SQL for property graph read queries (which Neo4j is helping to develop alongside Oracle, Microsoft, IBM and SAP), but those are limited enhancements for existing relational stores. “Native” graph databases or services don’t naturally relate to SQL. The property graph data model is a superset of the tabular SQL model, so it feels right to have a graph query language, GQL, that complements SQL. Property graph databases store data the same way that data is viewed in a conceptual “entity-relationship” model, familiar to data designers the world over. When you map an ER model to relational databases, you have to create foreign keys and link tables: in the graph data model, links or relationships are stored directly. Nodes and edges represent the topology of your data, and properties on those two kinds of structural entities hold data values (just like ER model entity attributes). There are three existing pure graph languages which use a shared “graph pattern” or “motif” metaphor for inserting, updating or extracting data from a property graph. 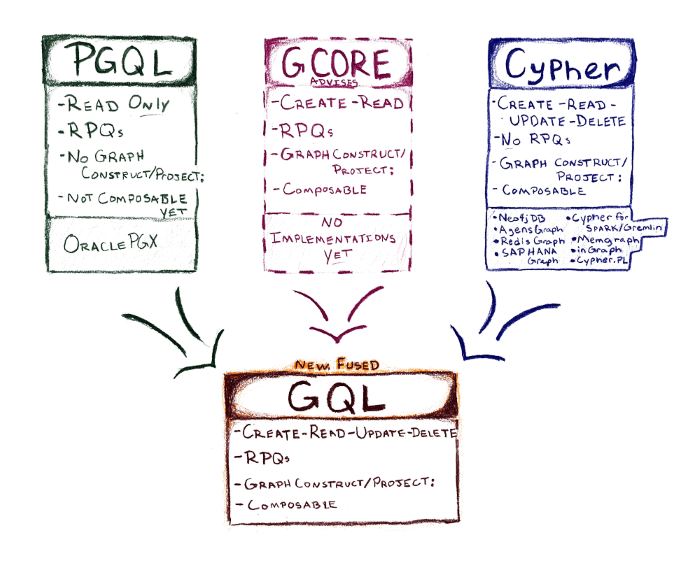 PGQL comes from Oracle PGX (first appearing in 2016); openCypher started out in Neo4j’s graph database in 2011 and is now used in four other commercial products. (Both languages have also been used in research projects.) G-CORE is a research language, described in a SIGMOD ‘18 paper written by several academics, as well as language designers from four industry vendors, working in the LDBC Query Language task force. The pattern means that all data in the graph that matches the sequence of nodes and edges (each of which has a particular “label” or element type) will be identified. This operation lifts a “sub-graph” or a “projected graph” of sales orders for a particular product into the application. Properties on all instances of :Customer nodes or :ORDER edges that match can now be read by the application. In PGQL this is achieved by a SELECT statement. at the bottom of the query, in place of the SELECT clause that PGQL positions at the top of the query. Cypher allows multiple queries to be chained, top to bottom, so the table coming out of one can feed the next. Despite that difference, this example shows how similar these two languages are.The same goes for G-CORE, which uses Cypher syntax with some PGQL variants, to form a base language used to explore newer features like graph query composition (“graph construction”). The idea is to fuse these three dialects into one standard language, GQL. That makes sense, not just because the languages look and feel very similar, but because if you combine all their features you get a full-featured graph query language that lets you create, read, update and delete data. connects_to here is a kind of named “pattern view”, which can be very useful for modularizing and simplifying code. The path expression means “the circuits that connect generators A and B through operational connectors”. In Cypher for Apache Spark and in G-CORE the next step is clear: queries that can project graphs as well as tabular data; and queries which can accept as input more than one graph at a time. New graphs can be created by combining graphs, or fusing sub-graphs from input graphs (and brand new data like new relationships can be added in the process). This opens the road to named graph-projecting queries (like SQL views), which have many uses, not least in masking sensitive properties to limit access for unprivileged users and in helping to abstract and encapsulate chunks of functionality. In that simple example we are just slicing out a subset of the input graph, which would pull in all the orders placed by Texan customers, and the associated products. We're already looking at other features GQL could inherit or extend from its source languages and there's a lot of opportunity to further improve modeling and implementation. First, changing another language like SQL or SPARQL to make it become fully “conversant” with property graphs is not easy or smart. We think that a language per data model is not a bad guideline. And property graph products and services like Azure CosmosDB, Neo4j or Amazon Neptune don’t sit on top of SQL engines: we need a language designed for the graph querying job, irrespective of the implementation. Then let the languages interweave where necessary: fold an RDF graph into a GQL view, perhaps. Second, SQL extensions for property graphs let you view tables as a graph and run read-only pattern matches to give back a tabular result set, which fits nicely into SQL clients and as a SQL sub-query. That’s reasonable, but anything more advanced, like graph queries that are functions over graphs, which return graphs, don’t fit at all naturally into SQL and will not be part of the SQL:2020 standard. A consensus on a practical and limited scope for SQL was arrived at earlier in May, and that made it clear that there would be no major confusion between SQL and GQL. GQL is a proposal to channel a period of convergent, criss-crossing and occasionally turbulent intellectual labour into an industrial standard that reflects more than five years of practical property graph querying, lives up to G-CORE’s aspirations and avoids idle variation. It’s going to take a lot of very hard work and a lot of patience and willingness to compromise, but it’s also an exciting and promising prospect. If you’re interested in helping in any way with making GQL a reality, please get in touch via the gql.today contact page! My view is that the process of designing and drafting the standard should be as open and as international as possible. 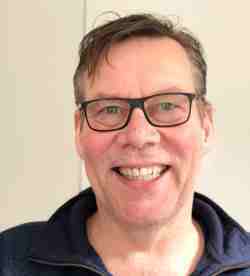 Alastair Green leads the Query Languages Standards and Research group at Neo4j Inc. He’s the product manager for Neo4j’s forthcoming Morpheus product (using Cypher for Apache Spark) and liaises with Neueda Ltd’s Cypher for Gremlin project team on direction and design. Alastair has worked for product vendors and enterprise end-user companies: for four years recently he led the Enterprise Data Distribution Infrastructure project at Barclays Investment Bank, which included an extended DocumentSQL language as part of a WAN-scale streaming query processor for end-of-day high-volume file data. He has a long history of working in the area of transaction management, and is a co-author of the OASIS Business Transaction Protocol standard.